Welcome to our wonderful Willow Guest Suite. 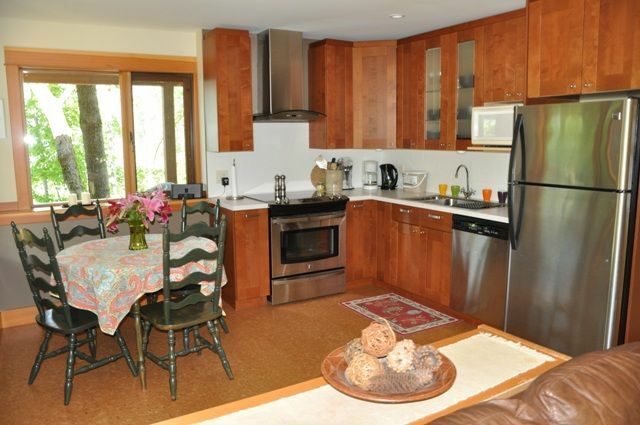 Our brand new vacation rental is a spacious 800 sq.ft., self-contained 1 bedroom plus den suite. Our vacation getaway is nestled against the mountains, and we overlook fabulous Kootenay Lake and the city of Nelson. You are now in the number 1 small arts town in Canada, and a short walk to historic downtown Baker Street, with over 50 restaurants, eclectic music at various performing venues, and new Nelson Museum and Art Gallery. Other amenities include a queen-sized extra comfortable bed in private bedroom, soft and enjoyable cork flooring with in-floor heating, a private entrance, inviting gas fireplace to cozy up to after a long day of skiing. With the Trans Canada trail in your backyard, you can mountain bike, hike or cross country ski from your doorstep. You are only 20 minutes away from the award winning powder skiing at Whitewater Ski Hill, a short ride to Backcountry lodges, or touring into the backcountry. Nelson is world renowned for mountain biking, but there are also beautiful beaches, extensive hiking trails, and an array of challenging golf courses nearby. We are truly a four season destination and our Willows Guest Suite is the perfect location for your adventuresome getaway. Your hosts are Dr Andrew Jones and his wife, Catherine. We are both working professionals, who love Nelson and all that it has to offer. We are here to make your stay as enjoyable as possible We are here to make your stay in Nelson as enjoyable as possible- this really is a fabulous place to explore and a great community to be a part of. We arrived via Nova Scotia, drawn to the mountain community and mountain culture; skiing, snowboarding, boating, fishing, wakeboarding, dining, music, hiking, mountain biking, golfing, are just some of their passions they get to indulge in here in Nelson. Our Willows Guest Suite is the perfect lodging with our private one bedroom plus den fully furnished suite. The suite contains a super comfy queen bed, double futon, fine linens, and cozy gas fireplace. Our suite has a fully equipped kitchen and fully anointed bath and shower. This is a wonderful setting- privacy in the city with an extensive private wooded area, that backs onto the Trans Canada Trail. We are only a short 10 minute walk to the downtown of Nelson. We love the views, the chance to be in nature, but still be within walking distance to all that Nelson has to offer. Gorgeous location and beautiful, comfortable, well-equipped apartment. Photos don’t do it justice. We arrived on Christmas eve to a beautifully presented property and welcoming Christmas cookies and Christmas tree. The property is nice and quiet, absolutely picturesque. Nothing was a problem and the owners were great! A short lovely walk landed us in stunning Baker St and a small taxi fare got us back up the hill :) We all were sad to leave and would love the opportunity to visit again! The apartment was well appointed! Location was great for walking the trail. We hope to come back in the fall when we can take advantage of the hiking and biking trails. Suite was very nice and comfortable for the two of us. Cosy and private home away from home! We stayed at this VRBO for three weeks while we explored the Nelson area. We found it cosy, welcoming and quite private. It backs onto the Trans Canada Trail (and lots of mountain biking/hiking) and has spectacular views of Nelson and the lake. We wouldn’t hesitate to stay here again. This was our 4th time staying at the Willow Guest Suite. Andy and Catherine are wonderful hosts. The suite is the perfect location overlooking the City and so close to town. There are walking trails up to the right of the property but we've always had too much to do to take time to explore them. We came to Nelson to Celebrate our 1st Anniversary as we got married here last year at this time. We really like Jacksons Hole for dinner, or the Hume hotel. Nelson is the undiscovered jewel of western Canada. Here you will find stunning scenery, with the largest inland lake in British Columbia, Kootenay Lake, abundant wildlife, natural hot springs, every recreation you can imagine; world class golfing, fishing, skiing, snowboarding, mountain biking, hiking…just to name a few. We have a wonderful climate, giving us warm summer days, with all the water sports you can imagine…swimming, fishing, water skiing, tubing, or off to the Hot Springs. Then there is winter and our epic powder. “Ski Canada” rated Whitewater as Best Deeps, Best Bowls, and Best Glades. “Powder Magazine” declared it among the best powder in British Columbia. Nelson has a vast arts community; hundreds of musicians, painters, where you may see their pieces in “ArtWalk” or at the new Museum and Art Gallery. We are a accepting community, otherwise known as ‘alternative’…most anyone will be at home here. Families with children do not pay the extra per person fees.